If Beale Street could talk, it would tell a very different story about Bernie Sanders than the now-familiar critique that he is insufficiently sensitive to racial issues. 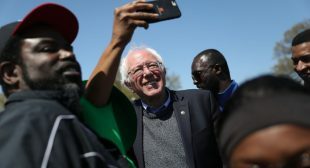 As I walked with Sanders down Memphis’s famous thoroughfare, his popularity, including among the predominantly black crowd attending the commemorative festivities, was self-evident. The senator was stopped every few feet by selfie-seekers and admirers. Yes: Perhaps this is to be expected of any politician with a national profile, but given his poor showing in Mississippi during the 2016 Democratic primary, in which he secured less than 17 percent of the black vote, I had thought the senator and his small cohort might go unnoticed. I was wrong.